Claterbos tells us that Franz had a shop at Zieglergasse 73 in 1860, and was still listed in 1897. This gives us a rough range of dates for this piece, though my eye suggests most likely from the earlier period, perhaps 1865 to 1875. While this piece is offered in “as found” condition, it offers you an opportunity to own a truly wonderful piece with the assurance that it can be expertly restored by SNClocks. Or, if you like, you can bring this piece back to life. The case is an excellent example of the restrained elegance of the latter half of the eighteenth century. And interesting, in that the break arch dial is not a very common feature of the Viennese clocks. While I am sure it is difficult to visualize, this dial will be a dream to restore - because of the beautiful engraving, both to the chapter ring and the dial plate, as well as the globe carrying the makers name. I am amazed at the detail found on this dial - with all the glorious Rococo excess, surrounded by the restrained simplicity of the case. When the hands are polished and re-blued, the dial polished to reveal all of its solid-brass glory, and the chapter ring and globe re-silvered this will be a stunning dial. If you like, please follow this link to see examples of dials that have been restored by SNClocks. 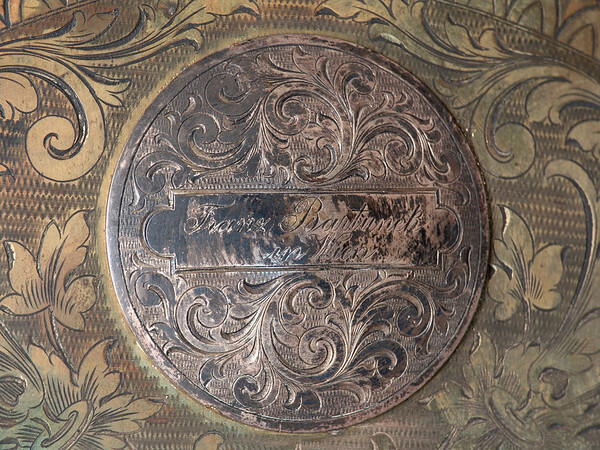 Of course, none of the examples have nearly a wonderful of engraving as found on this dial. While the piece is clearly in need of a good cleaning and polish, the case is generally in excellent condition. If you commission SNClocks to rejuvenate the case you will be able to add your input to the final look of the piece. Currently its color could best be described as a honey brown. This could be darkened readily to more of a walnut if desired. An interesting feature of this particular piece is the way the trim to the back of the case has been cut at an angle - to allow this clock to sit snugly in a corner - standing at a 45 degree angle to the walls. Unusual, but it clearly fit the needs of a specific room when the piece was commissioned. And, while it would be hardly noticeable if placed square against a wall, this does give you added flexibility in its placing. The mechanism, while dusty, is in excellent condition. An indicator I always rely on is the condition of the slots in the screw heads - so many have been damaged by repairers who didn’t have the tools, training, or patience to do good work. The screws holding this mechanism together, along with the thumb-screws holding the mechanism to the wooden seatboard are in virtually as-new condition. And, as can be seen in the picture of the gears in the mechanism - it is quite clean, but also dusty. It will be a pleasure to clean. And, with the biggest coiled gong that I have seen on a Viennese piece, its strike is wonderfully deep and melodious. Note too the near perfect weights and pendulum bob - ok, they are very tarnished, but I suspect the remaining finish is original - they will polish up to look fantastic. I especially like the pulleys with their clover cut-outs, and the cast iron winding key. A perfect beatscale, bubbly and wavy glass, an original upper-suspension block, you are looking at a very original piece, in a simpler, more elegant style with few of the ornate flourishes found on later pieces. Interestingly, the lower section of the case opens to a storage cavity which is not used for weight travel. So you can use it to store the family jewels, or perhaps your collection of rare gold doubloons. Somehow, based on the nicks in the trim around the bottom door, I don’t think it was used for storing anything so small. None the less, it will clean up very nicely, leaving you with having to decide if it needs to house your heirlooms. Another detail that I think speaks worlds to the quality of the case-makers work is the furring around the glass in both the upper and lower glazed doors. The strips of wood that hold in the glass are molded to exactly match the contours of the window. How much easier would it have been to simply make a square cut-out behind the curved facade - or even to just hold the glass in place with glazing points (those pesky little triangles of metal typically used to hold glass)? A gem in the rough - yes, a very large gem and yes, rough. But it will be stunning when brought back to its original condition. Of course, just when I think I have finished describing a piece I find that last detail that just demands inclusion. While I have never seen the like, the side panels of this clocks hood slide out - leaving the hood door in place, but also giving total access to the sides of the mechanism.